Bay Area housing market dynamics may be changing once again as a result of potentially large tech IPOs on the horizon. With Uber, Lyft, Airbnb, Pinterest, and Slack all believed to be going public in 2019, their rumored IPO valuations would all rank among the 10 largest venture-backed IPOs since 2012, according to CBInsights and Figure 1. In fact, if Uber alone stands to its valuation at $120 billion, it would be bigger than Facebook’s $104.2 billion valuation in 2012. Combined, the four potential 2019 IPOs could reach valuation of $176 billion, almost twice as large as Facebook’s 2012 valuation. However, even more importantly for the Bay Area, the headquarters of all four IPOs are in San Francisco. And, with Uber and Airbnb being among the largest employers in San Francisco, combined workforce of these four companies adds up to about 10,000 workers. 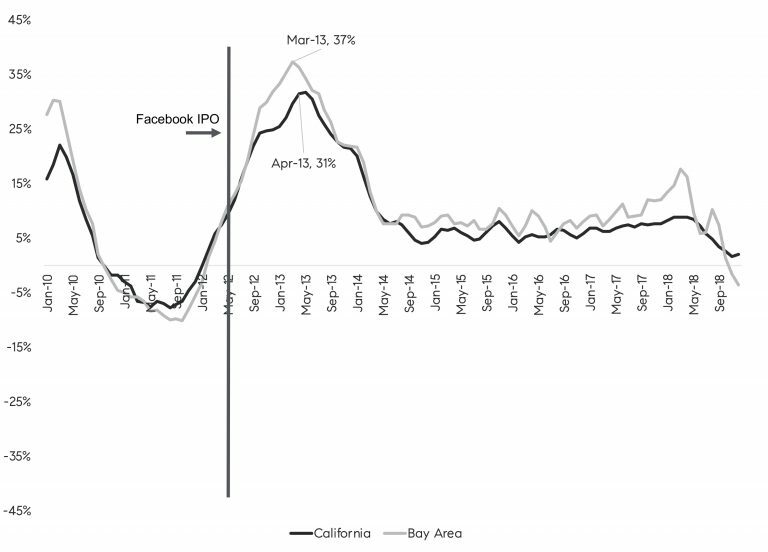 To illustrate the Facebook Effect, Figure 2 tracks 3-month rolling average of year-over-year change in median single-family home prices in the Bay Area and California, with the onset of Facebook IPO marked in May 2012. The chart illustrates that throughout 2011, year-over-year median price growth was negative, and turned positive in early 2012. However, in the year following the Facebook IPO, year-over-year median price growth in the Bay Area reached as much as 37 percent. At the time, California prices were growing remarkably strongly as housing market conditions at the time were very favorable and home prices still hovered at their post-bust lows. In addition, sale of higher priced properties in San Francisco surged following the Facebook IPO. Figure 3 illustrates year-over-year growth in sales of residential properties priced below $2 million and above $2 million. Higher priced sales started increasing in the last quarter of 2012 and jumped 84 percent year-over-year in January 2013. 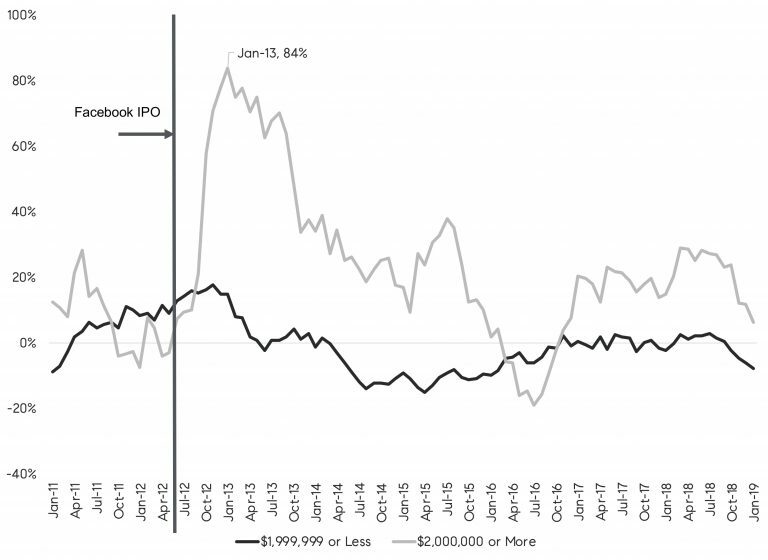 Note that Facebook shares employee lockup was between 90 and 180 days, thus the increase coincides with ending of lock-up periods. When they can exercise their options and ultimately when they decide to sell. Different options have different stroke prices pegged to the company’s private market valuation at the time they joined. Employees are subject to an IPO lock-up period, which is a contractual restriction preventing insiders who acquired shares of a company’s stock before it went public from selling the stock for a stated period of time after it goes public, typically from 90 to 180 days after the date of the IPO. Restricted stock units may be taxed at ordinary income rates, which can exceed 39 percent at the federal level, plus the applicable state taxes. Most importantly, current housing market conditions are notably different than prior to the Facebook Effect in 2012. Most specifically, median home prices in the Bay Area now are about 2.2 times higher than they were at the beginning of 2012. And, buyers have already shown significant restraint leading to a jump in price reductions in recent months. But, if IPOs do come to fruition and there are some newly minted millionaires, Bay Area housing markets could have another renaissance.